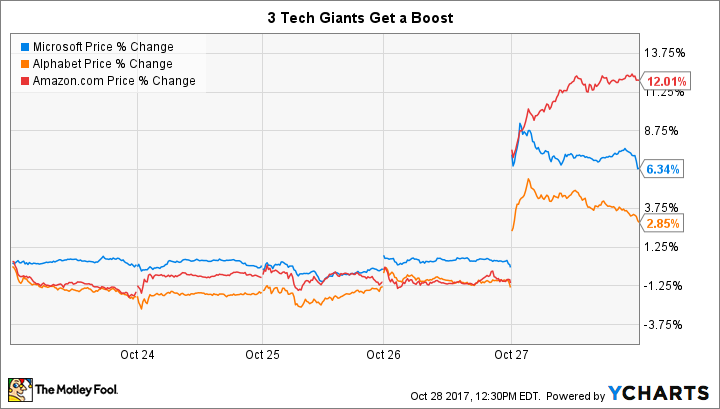 Lots of tech companies reported earnings last week, but three big tech companies in particular stood out. Amazon.com (NASDAQ: AMZN) , Alphabet (NASDAQ: GOOGL) (NASDAQ: GOOG) , and Microsoft (NASDAQ: MSFT) all surprised investors with better-than-expected quarterly results and finished the week up about 12%, 6%, and 3%, respectively. For all three stocks, strong business growth was the main narrative. Each company surpassed analysts’ consensus estimates for revenue and earnings per share. Here’s a closer look at each company’s results. Amazon’s third-quarter revenue was arguably the most impressive of these three companies. Management had guided for third-quarter revenue to be between $39.3 billion and $41.8 billion, representing year-over-year revenue growth between 20% and 28%. Instead, Amazon’s revenue surged 34% year over year to $43.7 billion. Earnings per share came in at $0.52 — flat compared with the year-ago quarter but far higher than a consensus analyst forecast for $0.07. Management said the quarter’s outperformance was primarily driven by a wildly successful Prime Day and big growth from Amazon Web Services. Also worth noting was management’s guidance for its fourth quarter. The company guided for fourth-quarter revenue to be between $56 billion and $60.5 billion, representing year-over-year growth between 28% and 38%. The high end of this guidance range would notably mark an acceleration over Amazon’s better-than-expected 34% revenue growth in Q3. Alphabet also posted strong earnings per share of $9.57, up 32% from year-ago EPS of $7.25, and well ahead of analysts’ consensus forecast for EPS of $8.35. While strong growth in Alphabet’s core advertising segment played a vital role in helping the company report strong top-line growth during the quarter, the company’s “Google Other” segment, which primarily consists of revenue from the Android app store, Google-branded hardware, and cloud services, also helped out. Google Other revenue climbed 42% year over year, growing from 10.8% of revenue in the year-ago quarter to 12.3% of revenue in Q3. Microsoft’s revenue for its first fiscal quarter of 2018 beat analysts’ consensus forecast by nearly $1 billion. Analysts were expecting revenue of $23.57 billion, yet actual revenue was $24.54 billion, representing a 12% year-over-year increase. Microsoft’s earnings per share of $0.84, which was up 17% year over year, easily beat analysts’ consensus estimate of $0.72. One of the quarter’s biggest highlights was Microsoft’s achievement of a $20 billion annual revenue run rate for its commercial cloud segment. 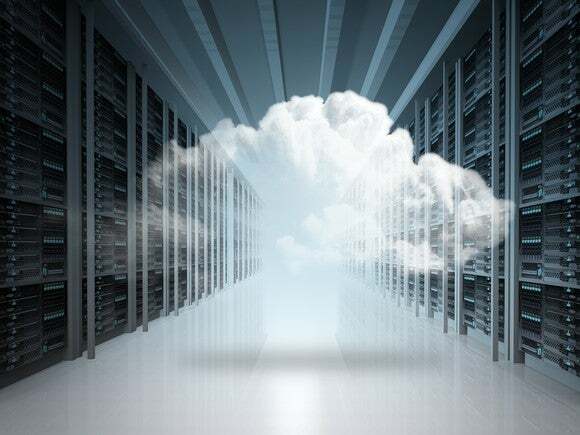 The milestone puts the spotlight on the company’s ongoing successful transition away from its Windows business to an emphasis on the cloud. One major driver for commercial cloud revenue was a 42% year-over-year revenue increase in Office 365 commercial revenue. The strong growth was nearly the same as a 43% year-over-year increase in Office 365 commercial revenue in Microsoft’s prior quarter, suggesting the important catalyst has some staying power. Of course, there were plenty of other notable stories in tech from the week, such as Twitter ‘s surprising user growth , and a possible buying opportunity for iRobot investors after a post-earnings sell-off. But it’s rare to see three of the world’s largest tech giants all jump on the same day. David and Tom just revealed what they believe are the 10 best stocks for investors to buy right now… and Microsoft wasn’t one of them! That’s right — they think these 10 stocks are even better buys. John Mackey, CEO of Whole Foods Market, an Amazon subsidiary, is a member of The Motley Fool’s board of directors. Suzanne Frey, an executive at Alphabet, is a member of The Motley Fool’s board of directors. Teresa Kersten, an employee of LinkedIn, a Microsoft subsidiary, is a member of The Motley Fool’s board of directors. Daniel Sparks has no position in any of the stocks mentioned. The Motley Fool owns shares of and recommends Alphabet (A shares), Alphabet (C shares), Amazon, iRobot, and Twitter. The Motley Fool has a disclosure policy .